a DroidGap parent class used for your own Java Droid activity class loading the main page (index.html) of your app. If you already have a significant development experience on a given platform (e.g. Mac OSX with XCode, or Windows with Visual Studio), then download the SDK for your platform and follow the corresponding Getting Started Guide. You will benefit from a more integrated experience and faster device emulation. Note for IOS: an Apple Developer License will be required if you want to deploy the app to your device (otherwise you will only be able to use the emulator). Note: I recommend the basic tutorial to create a basic Android app to ensure all the prerequisites are installed correctly. Then you can follow the PhoneGap Getting Started Guide for Android. In the rest of this tutorial I will assume that your mobile development environment is configured and working, and that you have successfully followed the PhoneGap Getting Started Guide. 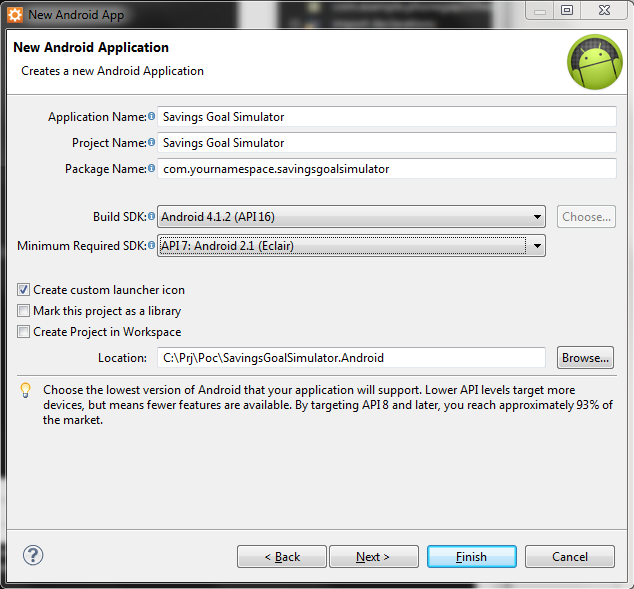 In the next sections I will use the Android platform as an example. Note: this tutorial builds upon the previous four tutorials and assumes you have built a rich interactive web application using view models, view mediators, and modularized views. Creating the actual app shell using PhoneGap’s Getting Started Guide for the platform you want to start out with. Let’s download the version of PhoneGap from http://phonegap.com/download and extract the content to a PhoneGap folder (e.g. 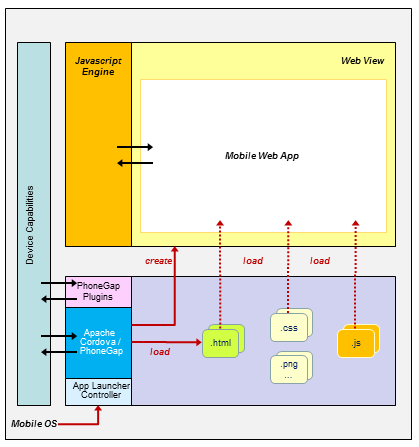 PhoneGapSDK). We’ll use the content later. 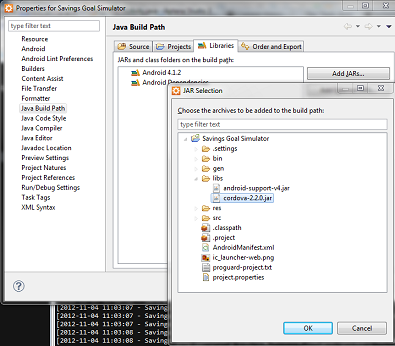 On the Android platform, the application shell takes the form a Java class called an “activity“. 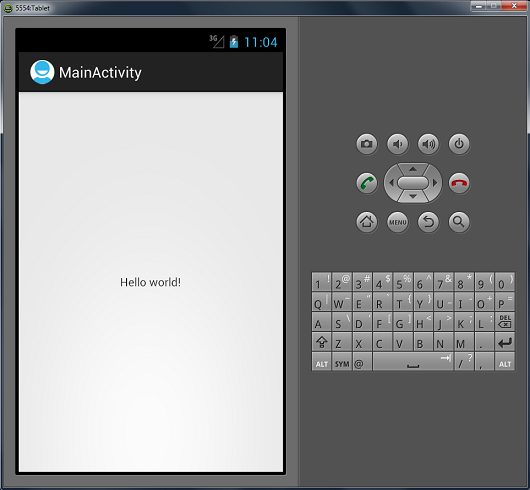 It inherits from the android.app.Activity which is the mobile app’s main application “controller“ in the Model-View-Controller sense. By default the project folder will be created in the default Eclipse workspace project unless you want to customize the path. 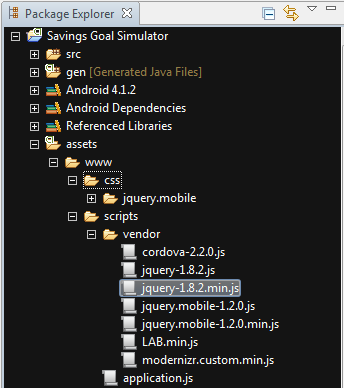 Expand the src folder recursively until you can see and double-click on the MainActivity.java file. Once we upgrade our app to PhoneGap, we will no longer use an Android content view nor a layout. Instead we will use a web view loaded with a local web page. 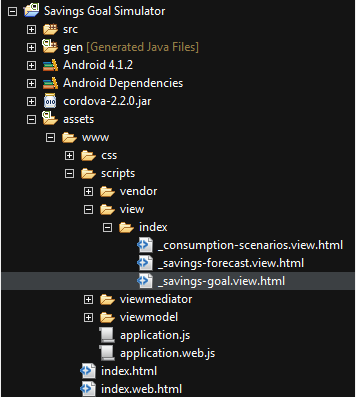 Let’s copy the Cordova Java archive (cordova-2.2.0.jar as of this writing) of the lib\android located in our PhoneGapSDK folder we extracted earlier to the libs folder of your project (the folder currently contains a file named android-support-v4.jar). 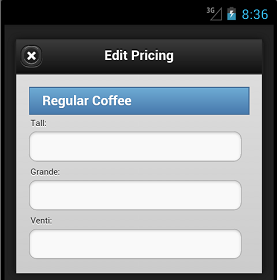 The Cordova JAR will now appear in Aptana Studio under libs. 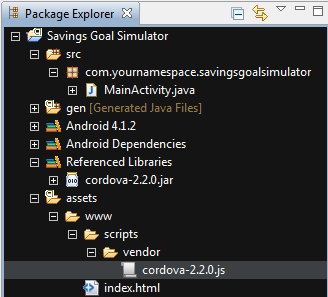 Now we need to add the Cordova JAR to the Java Build Path. 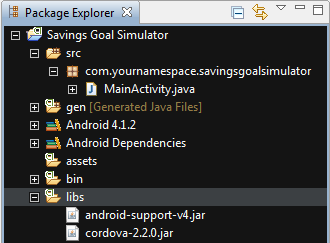 In AptanaStudio, right click on the libs folder, select “Build Path”, then select “Configure Build Path”, select the “Libraries” tab, click on “Add JARs …”, drill down to the libs folder of your project, select the Cordova JAR, and click OK. 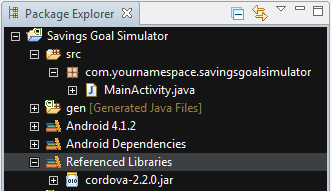 The Cordova JAR will also appear under the “Referenced Libraries” folder of your project. Let’s remove the onCreateOptionsMenu method as it is no longer needed. If we ran the app again, the emulator would tell us that the index.html could not be loaded which makes sense since we have not created it yet! Note that PhoneGap is looking for the resource in a www folder under a logical androidasset folder. Although it might seem counter-intuitive Android maps the “androidasset” url folder to the physical assets folder! So right click on assets and create the www folder. Note: if you forget this step, later the mobile app will show an error message indicating that the Cordova class cannot be found since the WebView will not be able to locate the Cordova plugins. Now you should be able to re-run the application and see the alert pop-up. Now let’s run the application again and our alert with the device information should appear! 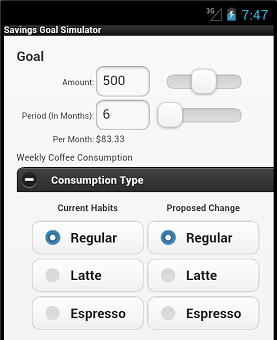 Since our app is built using HTML and CSS we can create a complete custom look and feel for our app. This is fine if you are creating something truly unique like a game or something very graphical. As the DOM is loaded, jQuery Mobile injects additional needed elements and CSS classes based on the various data-* attributes to produce the desired effect. We’ll use external views based on templates and the jQuery View Loader plugin to address this issue. Defining common elements such as the bottom toolbar for each “logical page” also requires the use of templates if we do not want to duplicate the markup over and over. Since the markup is automatically enhanced as it is being loaded, dynamically changing elements becomes a bit more complicated since jQuery Mobile needs to be notified to “re-enhance” the new markup fragments. 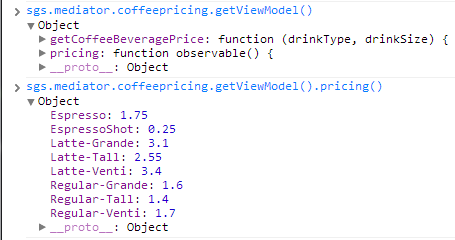 This will become even more apparent when we use a viewmodel to view data-binding library like KnockoutJS. But again there are some solutions. Overall despite the learning curve and the need to make jQuery Mobile “play nice” with other libraries manipulating the DOM, the benefits strongly outweigh the challenges. This tutorial will provide the necessary guidance to increase your chances of success. 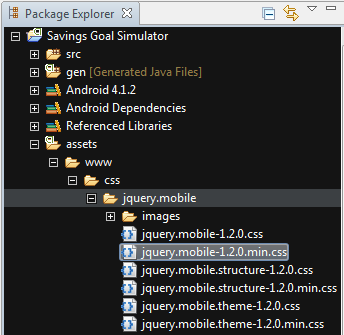 First, download the full ZIP version of jQueryMobile and extract it out locally. Before we add the files to our project, let’s create a css folder under assets/www. This will provide a central place for all CSS files needed for our application. Now let’s go back to our index.html page and add the jQuery Mobile stylesheets. We’ll also add a meta tag to provide device information which will be leveraged by jQuery Mobile to optimize rendering for the device. jQueryMobile fires an event named mobileinit as soon as it starts executing. Since we may want to override some of the framework defaults (more on that later), let’s add a script with an event handler for mobileinit. Since we want to setup the event handler before jQuery Mobile starts to load, we’ll define the script right before the inclusion of jQuery Mobile. // IMPORTANT: This must execute before jQueryMobile is loaded! Now run the application. What do you notice? The “page-home is ready!” alert message appears BEFORE the PhoneGap alert message! 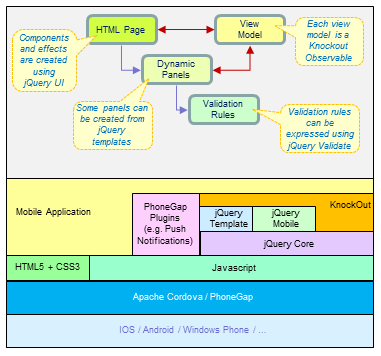 Well, jQuery Mobile starts processing the markup as soon as it is created while PhoneGap deviceready event is not triggered until the whole physical page is loaded and until the PhoneGap library is fully initialized. So at this point, we have a minimal PhoneGap + jQuery Mobile application! To make troubleshooting easier, let’s make a couple changes so that we can run the web version using index.web.html in a browser. This way we can always compare our mobile version to the web version to help identify and resolve potential issues. Now we are ready to adapt our web app into a mobile app. The idea is to progressively enhance the basic index.html we created in the “Adding A jQuery Mobile Shell” section by incorporating elements of the web version of the app. 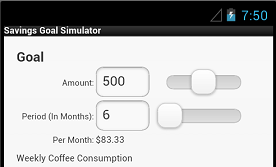 The modest goal for this section is to be able to bring up the Savings Goal Simulator in the mobile device simulator. Now the application should work correctly in the simulator. If you run the app in the simulator or the browser you will see in the console that each of the module is being loaded. As a brief reminder, the scripts of type text/html represent definition of jQuery Templates used to render views / panels within the app using data-bind tags. 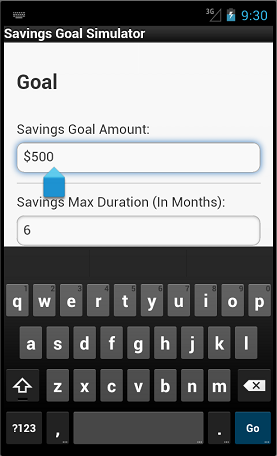 So the data-role=”content” div contains 3 views to track the savings goal, scenarios, and corresponding forecast. If we run the app now the views will not appear as we have not yet ported over the view loading logic. In the web version, the view loading is done in the InitializeApplication function of application.web.js. Let’s copy the content of application.web.js at the end of application.js and rename the InitializeApplication we just copied to LoadApplicationViews. If you look at the code for LoadApplicationViews you will notice that it using the jQuery View Loader library to identify and load all templates (scripts of type text/html). 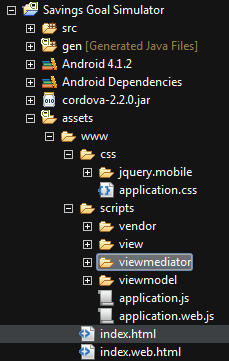 Note: make sure you at least have version 0.3 of jQuery View Loader (to ensure compatibility with jQuery Mobile). You should now be able to run the application and see the views appear (in the simulator or browser). As you can see, even though the app actually works, it is not really usable and we will definitely need adapt the layout and styling of the web app to fit the much smaller screen dimensions of a mobile device. 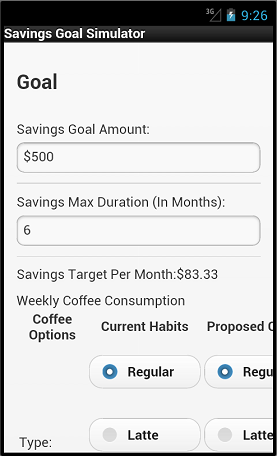 So let’s start with the “savings goal” panel first. This way we can keep a baseline of what the web version looks like while we customize the mobile version. Let’s wrap the first pair of label + input with a div with a data-role=”fieldcontain” so that jQuery Mobile can enhance it to make the field bigger. Yippee, we now have a numeric keyboard, and notice that there is a Next button to navigate to the next input field! Now we can use the appropriate numeric keypad to enter values, but it is still not very convenient if we want to vary the values and really test their impact. What we need is the jQuery Mobile slider. And moving the sliders should automatically change the values. So far we have only used the default style sheets from jQuery Mobile. Let’s integrate the original application.css from the web version. To allow the application to adapt to different form factors, we will create different CSS files and direct the browser to use the appropriate stylesheet based on the media directive. In index.html, after the include for application.css, let’s add two new include statements, each specifying what values the media query should match. This stylesheet should be used if the maximum device width is 1024px which usually means a tablet. This stylesheet should be used if the maximum device width is 480px which usually means a phone. 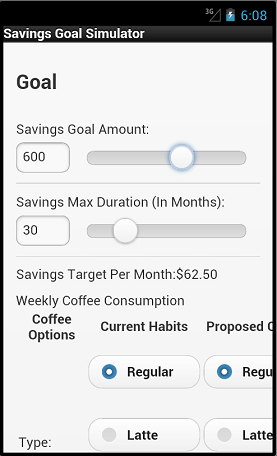 At this point we could continue adapting the look of the Savings Goal panel, by adjusting the CSS styles to make it fit a little bit more tightly. The easiest way to do that is to use your trusted browser developer tool to learn what styles are being used by jQuery Mobile and to experiment. I will leave this as an exercise for the reader. 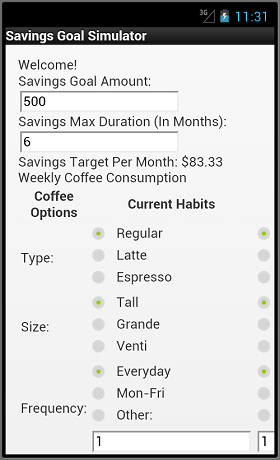 In the web version of the application, the different type of coffee consumption options consists or set of radio buttons layed out in a table. 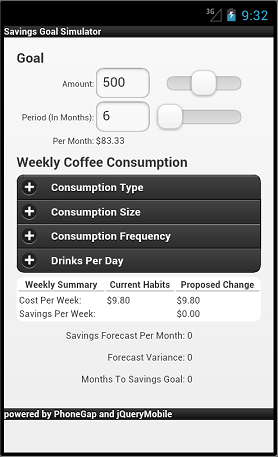 But at minimum for a phone version of the app we need to conserve the vertical space so we can see the goals, a subset of the consumption options, and the savings forecast. So let’s use collapsible panels for each type of consumption option such as “type” (of beverage), size, and frequency. This way as a user you can expand the option you want to play with, tweak the current and proposed settings, see the impact on the forecast, and repeat the process. Again we now have a baseline of the original web version. Right below the header but before the table, let’s add a div of [jQuery Mobile] data-role “collapsible-set” indicating that contained elements of data-role “collapsible” can be grouped together. Let’s remove all the <br/> tags since we no longer need them since jQuery Mobile is enhancing our DOM and styling new elements. Let’s run in the browser and the simulator. jQuery Mobile has rendered our radio buttons as regular buttons. Apparently jQuery Mobile require a radio button group to be codified as a fieldset with a data-role of “controlgroup“. 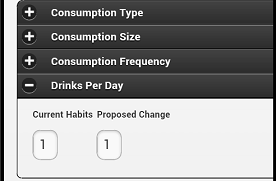 Add a div of data-role “collapsible” for our consumption option. The div will contain a h3 for the panel title, followed by a table element to hold the details of our option. Now the positioning is much better! Now we need to cleanup the bottom remaining table in _consumption-scenarios.view.html. Let’s cleanup the obsolete table header and let’s reuse it for our weekly summary. You will notice that we’re pretty close to our goal of optimizing for the vertical height of a phone! Ideally we would like the forecast panel to be visible at all times. An idea is to integrate it in the footer of the page and “pin” the footer at the bottom of the screen. To “pin” the header, let’s add a data-position=”fixed” and data-fullscreen=”true” as attributes on the footer. And while were at it let’s specify a different jQuery Mobile theme for the footer using data-theme=”e”. Let’s remove the word “Consumption” from our collapsible panels. The look is now a bit more “professional”, the visual elements stand out and the vertical positioning is optimized. Originally the web app depended on jQuery UI, but since we’re usin jQuery Mobile instead, we will need to tweak the mediators associated with our panels. Two view mediators use the jQuery UI highlight effect to provide a visual indication of key changes. But now that we have sliders, the effect would take too long since it would be triggered on each mouse move. So let’s remove the effect. So if you had been noticing exceptions for the effect call in the browser console, now these are a thing of the past. 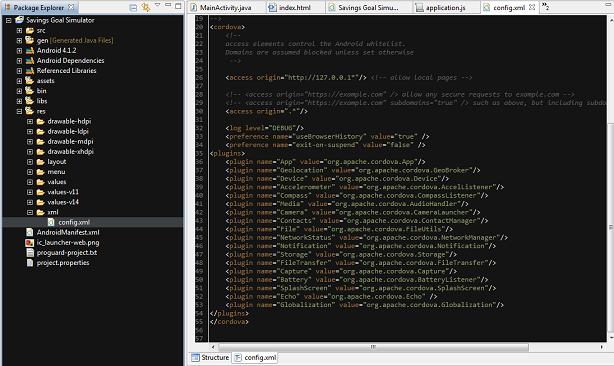 Currently our application has only one jQuery Mobile “logical page“, that is, a div with a data-role=”page”. It would be nice if we could have another page to edit the coffee beverage list prices! jQuery Mobile allow the definition of multiple pages and provide associated navigation mechanisms. So let’s see how to do that. Shell for our price list! You will notice that we specified a data-rel attribute with a value of “dialog“. This tells jQuery Mobile that we would like a pop-up transition effect and a dialog theme: dark background, rounded corners, etc.. See the Dialog documentation for more details. If you hit the back button, the page-home page will be displayed again (without any of our values to be lost – since the pages are just hidden/shown during the navigation process). ask KnockoutJS to render it. This allows the inclusion of our new jQuery template in the app. 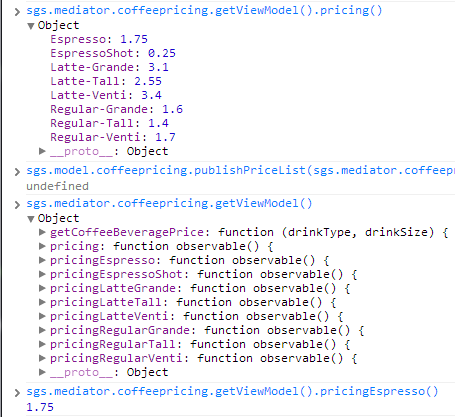 Note: the afterRender callback references a setupViewDataBindings function we have not yet created in the sgs.mediator.coffeepricing module. So if you run the app now, the content of the view will not be rendered. 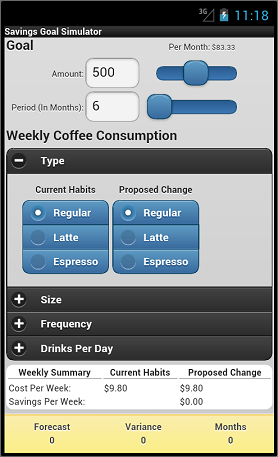 You can repeat the process for the beverages like caffe latte and espresso. If you run the app you will see an empty dialog since we have not created a value models for each of the pricing options in the pricing view model, nor added the data binding for the various fields yet. Let’s add a new function named publishPriceList to our sgs.model.coffeepricing module. You now see the new value models! This way the new value models will be created upon initialization of the view model. And if you update a price, close the dialog, then reopen it the new pricing is still there. But you might notice that the calculations are not reflecting the price update. And if you closed and terminated the mobile app and relaunched it your new price would be lost. Let’s add a click event handler for our new button in the setupViewDataBindings function of the sgs.mediator.coffee-pricing.js module. 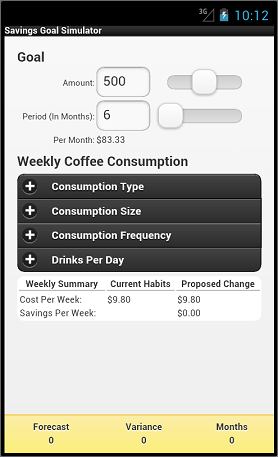 If you re-run the app, you now should be able to see the impact of updating the pricing of a regular tall coffee from 1.4 to 1.5. And if you restart the app you should see that your pricing data had been saved and restored. 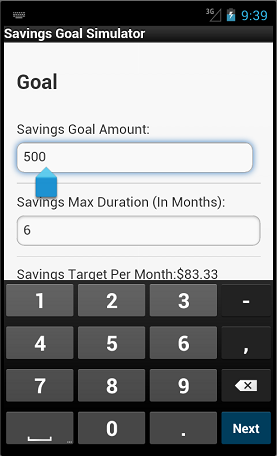 At this point you have a well-rounded mobile version of the Savings Goal Simulator! Note: as an exercise for the reader, go ahead and externalize the content of the #page-home as a separate template named index.view.html in the assets/www/views/index folder. This will keep the overall index.html main page as small as possible. Currently we have an index.html which is primarily designed to fit on a phone. And although it will take the full size of the display on a tablet, the application will still work fine. But what if we want to offer a more optimized design for a tablet such as for example do away with collapsible sections, or change the layout of the app? Well, this is where the modularity of our views and application, plus the use of HTML and CSS will pay off. Have a separate main web page for the phone and for the tablet version and launch the appropriate page based on the device display size. The first option provide the most flexibility, so let’s look at how to implement it. // Is the width is at least the minimum width of a tablet? Note: we had already included a media query and conditional inclusion of device-specific CSS (see the “Adapting The Stylesheets For Mobile Use” section details) in our main html page. So now you can expand the customization to suit the appropriate device. Of course, if your mobile application is for public consumption (for free or for sale) then the hosting guidelines of your platform apply (e.g. Apple AppStore, Google Play, Microsoft Windows Phone App Store). But if your mobile application is for enterprise consumption, provided that you are enrolled in an enterprise program (e.g. iOS Developer Enterprise Program), you can create your own “custom app store” as a web application, require user authentication and authorization, tailor the app catalog based on user privileges. In that situation, each app has a link to either the package (for Android) or an application descriptor (for iOS – .plist file) which contains the location of your application package (e.g. 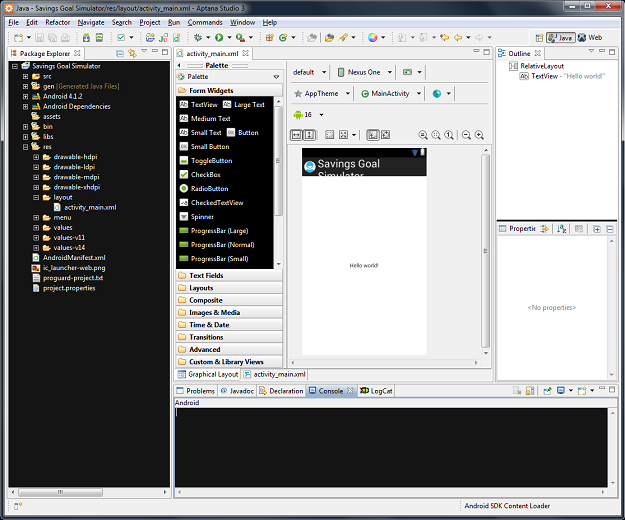 Android .apk file, iOS .ipa file). Clicking on the link triggers an “Over The Air” installation of the application once you have approved the process. This section was meant to just give you a sense of the possibilities, but you will need to refer the corresponding platform documentation for details. These more advanced topics will be the subject of a separate tutorial. So if you have solid web skills it is time for you to apply them towards the creation of mobile apps! If you enjoyed this post, I would love it if you could check out mySkillsMap, my skills management app.